Located just west of Exit 2 of Interstate 91 in Brattleboro, Vermont, Living Memorial Park and its predecessor, the Guilford Street Ski Tow, have been serving local residents for many decades. Lift served skiing at the present date Living Memorial Park likely dates back to January of 1938, when the Guilford Street Ski Tow opened to the public. Located on the Charles Clark Farm, the tow was 1,100 feet long. The Brattleboro Ski Patrol was also formed that month, reportedly making it the second oldest group in the National Ski Patrol. 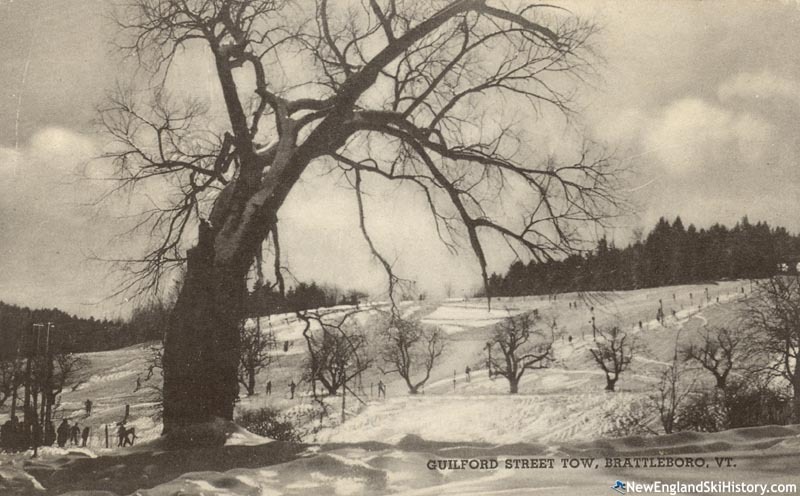 While World War II closed many ski areas throughout New England, the Guilford Street Ski Tow remained in operation. The tow was likely removed circa 1948, however, and installed at nearby Sugar Bush ski area in Jamaica, Vermont. Brattleboro's Living Memorial Park concept likely dates back to June of 1944, when a letter published in the Brattleboro Reformer suggested a war bond fund be created to establish a "Living War Memorial." The Brattleboro Reformer and the local Kiwanis advertised and overaw the fund in subsequent years. A decade later, a 53 acre farm plot was procured, becoming the site of the Living Memorial Park. After a town vote on December 20, 1955, the $115,000 bond issue was used to constructed a swimming pool, bath houses, snack bar, and warming hut. Publisher Howard C. Rice donated $3,000 for a skating rink, while the local Rotary Club contributed $1,500 toward purchasing a rope tow, restoring lift served skiing to the slope. The Living Memorial Park was in full operation by the end of the winter of 1956-57. Eight years later, a $30,000 fundraising campaign was launched to purchase a 1,300 foot T-Bar. A Doppelmayr T-Bar was likely installed for the 1964-65 season with Hogback ski area covering the shipping expense while purchasing two T-Bars for itself. Hogback vice president Nelson Withington received a National Community Area Service Award in 1972 for his role in the "installation of a lighted ski lift in the park." 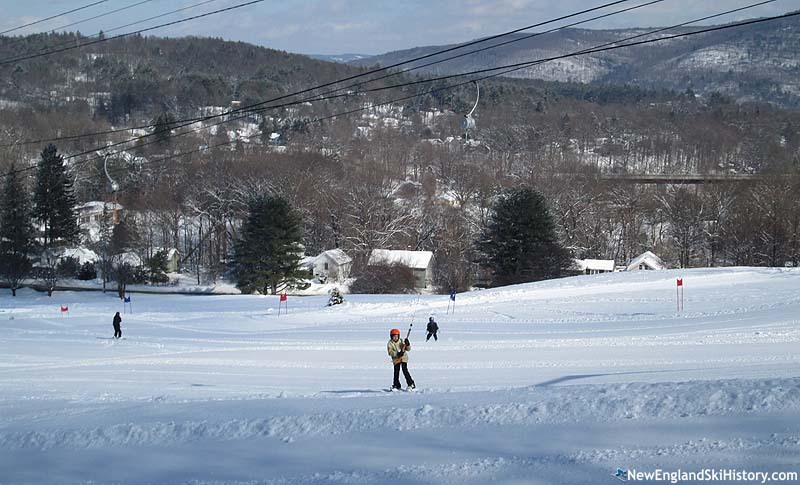 After three decades of operation, the town of Brattleboro likely closed the ski area following the 1994-95 season, reportedly due to poor snowfall and being overshadowed by nearby Maple Valley. The non-profit Living Memorial Park Snow Sports, Inc. was formed in May of 1997 and quickly worked to reopen the area, likely reopening in February of 1999. The resurrection was timely, as Maple Valley ceased operating in 2000. 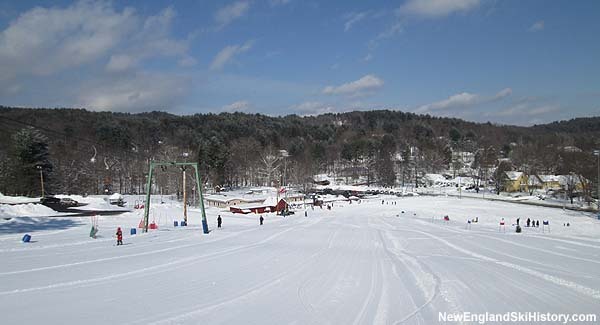 In advance of the 2018-19 ski season, the Living Memorial Park became known as Brattleboro Ski Hill. Donations and proceeds were used to rebuild the T-Bar motor that season. Brattleboro Ski Hill remains in operation to this day, featuring the T-Bar, night skiing, snowmaking, and grooming.